No doubt you're all still buzzing from Game of Thrones' highly anticipated 7th season opener. Poop scenes and Ed Sheeran cameos aside, eagle eyed fans are always quick to notice the easter eggs and hidden themes woven into Game of Thrones' imagery. After Sunday's premiere, some fans think they have a new theory about the complicated correlation between Cersei Lannister and Sansa Stark. Spoiler-ish things ahead. Proceed with caution. Season 7 opened with Sansa and Jon clashing over how best to deal with the threat of Queen Cersei. Of course, you'll remember that Sansa is quite familiar with Cersei's character after spending earlier seasons in King's Landing under her thumb. After warning Jon that Cersei was a much bigger threat than the Night's King, Jon remarks, "you almost sound as if you admire her." To which Sansa replies, "I learned a lot from her." 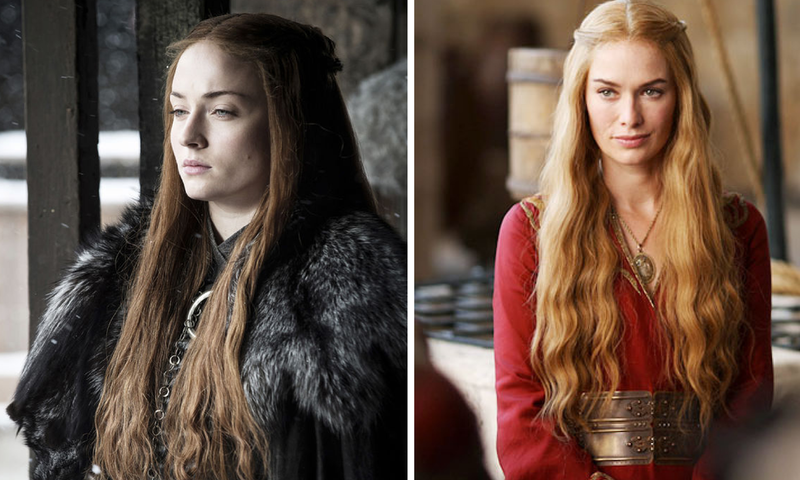 Fans have noted that it's not just the way Sansa talks about Cersei that might highlight parallels between the two. It's the aesthetics too. Cersei has had a cropped cut since the end of season 6, but fans are noting that Sansa's new look is a bit Cersei-ish circa earlier seasons. 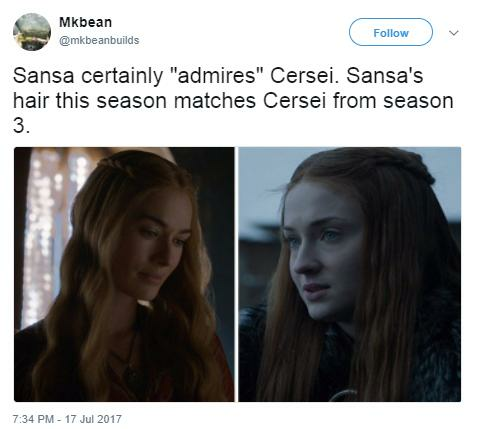 On top of that, Sophie Turner mentioned back in June that Sansa's hair and style choices are "never random". "Sansa’s hair is constantly reflecting the people she’s learning from, or mimicking, or inspired by at the time," Turner told Refinery 29. "When she’s Cersei's prisoner, and she’s kind of absorbing all her manipulative techniques, it’s reflected in her hairstyle, and when she’s finding the spirit of Margaery in herself, she wears her hair like Margaery." Fans are now wondering if Sansa's story arc is bending toward a rift between her and Jon Snow and, perhaps, a dash of Littlefinger's influence. We know that any student of Cersei's could be capable of anything and, if this plot device pans out, it could be huge.